Small Caps Hitting 2009 Oversold levels! 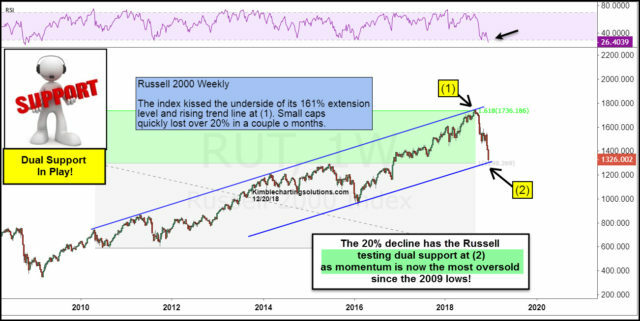 The Russell 2000 it’s 161% Fibonacci extension level in August and (1), where it quickly reversed and declined more than 20%! The swift decline now has small caps testing rising support and its 2015 highs at (2). While it is testing dual support, weekly momentum is now reaching oversold levels. The last time momentum was this low for the Russell was at the 2009 lows. Until broken this is a strong support test for Small Caps! This is a critical test of support for the long-term trend in the Russell. FITTON: PROOF: We are in Syria because of Obama and Hillary–key document tied Benghazi, to Western support for AQI and rise of ISIS.